SPORTING PERSONALITIES: Just think of it, what a fabulous feat for a sportsman to win 15 (fifteen) Gold Medals. This happened over a decade ago for Sri Lanka, at four separate SAF Games - in 1984, 1987, 1989 and 1991. This amazing accomplishment, which brought fame and glory to a sensational Swimmer, belongs to Julian Bolling! In addition to this, he is the only Sri Lankan swimmer known to have participated in three Olympic games, first at Los Angeles (USA) in 1984, then at Seoul (South Korea) in 1988, and finally at Barcelona (Spain) in 1992. Isn't this an unique achievement? Borrowing a 'simple' word from Mary Poppins - 'supercalifragilisticexpialidocious' - may help to express the extensive wonder of it!! Julian first swam for Royal College, Colombo from 1977 to 1982 and was coached by E. G. A. Wilson, a famous national record holder in the 100 metres Back Stroke. From 1982, his mother, Tara Bolling, (Sri Lanka's 'Wonder Star' and women's champion of the fifties and early sixties, who represented Sri Lanka at the Commonwealth Games held in Cardiff (Wales) in 1958 and then obtained 4th place in the 400 metres Free-style at the Asian Games held in Tokyo (Japan) in the same year), took over the solemn task of disciplining and training her son to become a 'golden swimmer'. Julian also recalls 1979 as a memorable year, when he and his two elder brothers David and Jeremy, represented Sri Lanka for the first time in the Indo-Sri Lanka- Bangladesh Swimming Triangular Meet. In fact, David Bolling won the Gold Medal in the 1500 metres Free-Style and Julian came in second, to win the Silver Medal. 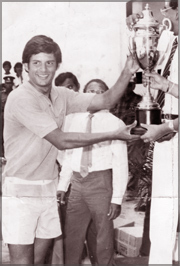 In his quick recollections of many outstanding swimmers, apart from his mother Tara, cousin Nangi de Saram and Renuka Ranasinghe, Julian regards Timothy Speldewinde as another brilliant swimmer from Royal College, who represented Sri Lanka through the 70's and in 1979 to win the 200 metres butterfly stroke at the Asian Games. Thereafter, Julian took over these events and represented the country in the 1986 Asian Games, winning many Gold Medals and establishing Games Records in the 400 and 1500 metres Free style and Individual Medley. He regards his appointment as overall Captain of the Sri Lanka contingent at the SAF Games held in 1989, in Kathmandu (Nepal), as a great honour to this day. His sentiments were expressed of joyful college days and his beginnings of swimming along with Piyal Hewage, Lalindra Gooneratne, Arjuna Puvimanasingham, Creon Corea, Pravir Samarasinghe, Jayantha Gamage, the Ross twins Naresh and Suresh-and then his sorrowful remembrance of losing his father Ralph Bolling, a veteran Tea-Planter and a true believer in the Lord Jesus Christ, who died of a heart attack in May 1991. This occurred just prior to the SAF Games held in Colombo, in which Julian wrested five Gold Medals! Perhaps he was supernaturally inspired to honour his Dad's support and Godly encouragement towards his success. Julian was taught to put God first, others second and himself last, in everything. Although be entered his 40th year on 19th June 2006, he remains a 'highly eligible' young bachelor, who has tried all the strokes in swimming but yet prefers the 'free-style' in life. Since obtaining a Marketing Degree from the University of Clarion, Pennsylvania (USA), Julian returned to Sri Lanka in 1992 and worked at Nestles' Limited, Colombo - but soon preferred to abandon an office desk and 'take to the waters' , to join his mother Tara and father Ralph, who had launched out the Rainbow Aquatic Club. Later, the Rainbow Swimming Academy was set-up with his brother David, with the sole aim of teaching children and adults to swim and save 'souls' from drowning! They have also coached with great success, many who desired to compete in local and foreign swimming meets. Among a list of 'achievers', there is Menaka de Silva, who represented Sri Lanka in the Sydney Olympic Games in 2000 and the SAF Games in 2003. Chaminda Priyadharshana, a 'disabled' soldier, whose remarkable performances took him to the recent Para-Olympics in 2004 to participate in the 100 Metres Back Stroke in Athens (Greece). After the shattering tsunami in December 2004, a retired British army officer Tony Ballard and his concerned wife Petronella, set out to the Southern fishing villages that had been ravaged by the swirling waters, to provide them with essential supplies. However they were soon made to realize that most people including children could not swim. They immediately needed the services of a competent coach who could teach people the basics of swimming. Julian Bolling was contacted and despite his other heavy commitments in Colombo, he had no hesitation in helping out. Tony and Petronella were virtually 'blown off their feet' when they asked "When do we start?" and Julian replied "Today!" - Together they worked out a programme, now named 'Swim-Lanka' (www.swimlanka.lk), which has 32 local Instructors working with 26 'wading pools' in various coastal communities. As petronella said, "We've all seen the tears, the horror, the immense pain." Yes, Julian Bolling has been a vital link and played an important part in putting love, smiles and happiness back into these peoples' lives - and using 'Swim-Lanka' to give them a future, when life seemed bleak and frightful. With the 10th - South Asian Games being staged in Colombo from 18th to 28th August, at the Sugathadasa Stadium, Julian has been called to assist in the planning and preparations of the 'swim scene' and he has 'dived' right into it, to give the best of his time, knowledge, experience and ability for the country and for his best-loved sport - swimming!!! Deshabandu Julian will always be a 'golden legend' in the history of Sri Lanka sports.